Children that are born to a Christian family undergo a religious rite of having water sprinkled onto their head or being fully immersed in water to purify and submit themselves to the Christian Church. In many denominations, this ritual is performed on young children to welcome them into Christianity and is often accompanied by name-giving. Given how valuable this practice can be to many families, cards of various types are made to help celebrate the occasion. There’s no harm in being a proud parent, even it means holding a small get-together with your loved ones to celebrate a significant milestone in your family’s life. Expressing your sincerest gratitude to those who have attended the gathering and sent their well-wishes in the form of gifts and heartwarming messages can easily be done through a thank-you card. 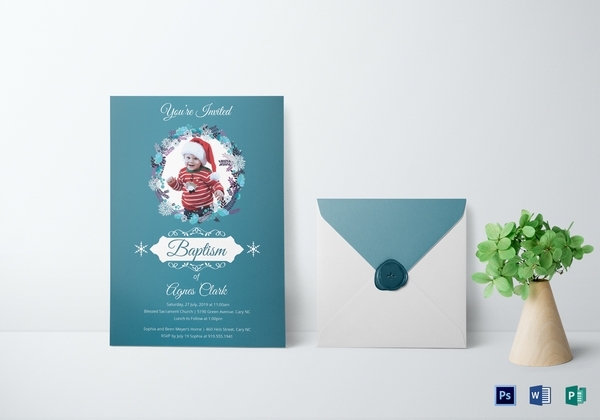 A baptism thank-you card should be enough to make a person feel appreciated for their presence at the event. Hosting a party to celebrate one’s baptism is pretty common in some traditions. 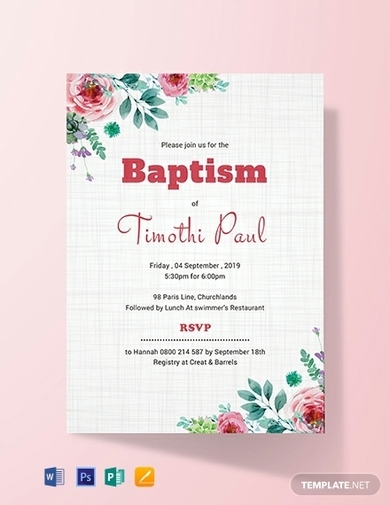 Close friends and relatives of the proud parents usually send baptism invitations prior to the actual date to secure the attendance of each guest. 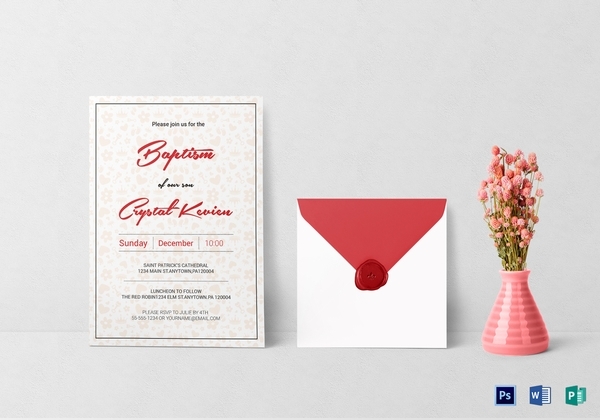 To make it easier for everyone involved in the planning and organizing process, using an invitation template to design your card would be an efficient alternative as opposed to building everything down from scratch. A baptism held over the holidays is always the most festive one to plan. 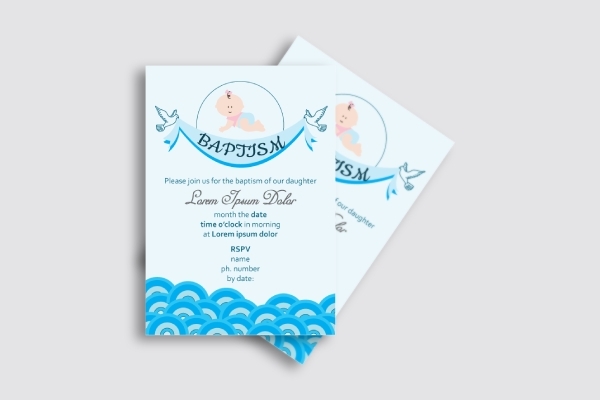 Whether you have a son or daughter to baptize, this baptism invitation card in the shades of blue will be a great addition to your collection of stationery. You can use the invitation to gather guests at the event venue according to the details indicated in the card. Feel free to add a photo of the child to turn the card into a commemorative token for a keepsake. In some branches of Christianity, particularly in Catholic and Episcopal churches, the Sacrament of Baptism is given along with a naming ceremony for the child. This marks the early beginning of an individual’s admission to the Christian Church. A child’s christening traditionally happens alongside a baptismal ceremony to show how much the child means to the family as a blessing from the Man above. In some countries, christenings are often perceived as a big deal to families, where invitations are sent to gather everyone for the celebration. The art of using plant materials and flowers to achieve an aesthetically pleasing and balanced composition is pretty common in most crafts. 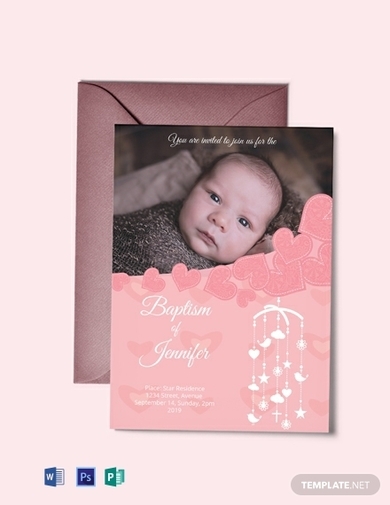 Thus, using a floral design for your baptism card is sure to add a sense of tranquility and innocence to the occasion. The best way to obtain a trendy yet timeless design is to always stick with something simple. This invitation card can help you do just that through its captivating combination of text and graphic elements that accurately depict the essence of the celebration. This allows you to get a message across more clearly for your recipients to grasp. One thing to remember when designing any form of stationery is to always make the purpose of the card clear to your audience from first glance. It doesn’t matter how simple you make it, as long as people can quickly comprehend what’s written on it without much effort. Also, make sure that the card contains the exact details that recipients are meant to know about. Given what the celebration symbolizes, everyone in attendance is required to look their best as they witness the religious ceremony transpire. 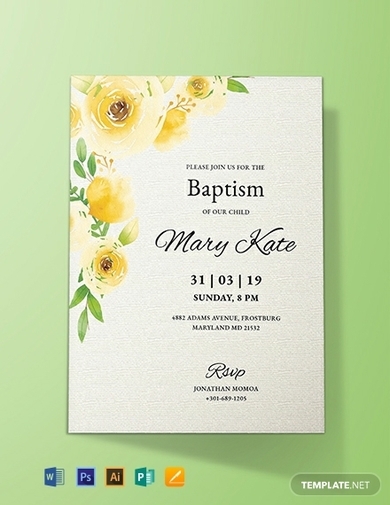 This is one of the reasons why designing a formal invitation card is highly advisable for funerals, weddings, and baptisms. You can use to formally invite your family and friends to the gathering in the most creative and appropriate way possible. Has it been a year since your child was baptized? 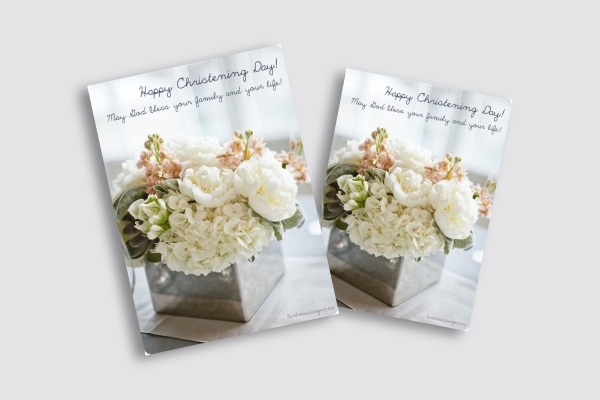 Celebrate your lives as Christians by sending anniversary greeting cards to remember this special day with your loved ones! You can host an intimate gathering at your local church to pay tribute to the religious ceremony while surrounded by the people you care about the most. 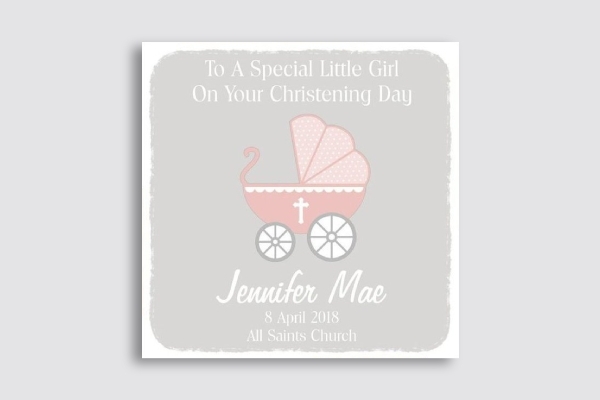 Whether you’re a proud mother, grandmother, godmother, or aunt, you can use this personalized card to celebrate the baptism and christening of your baby girl. 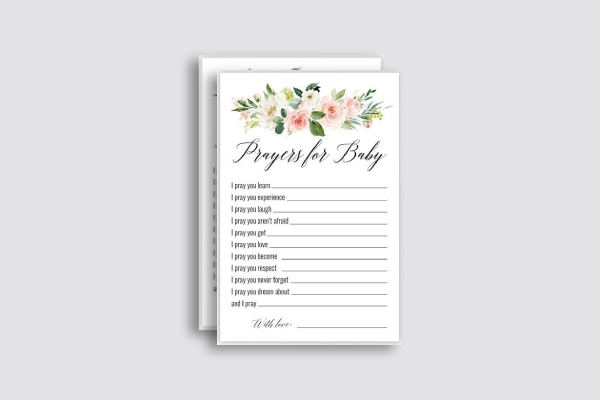 You can even use the card as a baby announcement to let your recipients know about the birth, gender, and baptism of the baby, especially when you’ve been extremely private during the previous months. Most denominations in the Christian faith practice infant baptism. Here, young children are baptized to cleanse them from Original Sin as they become official members of the Church. 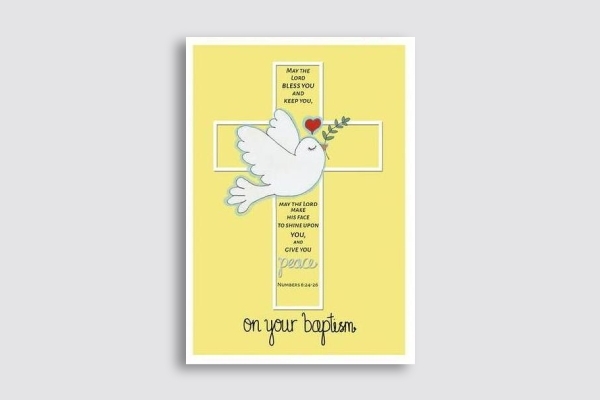 If you practice this tradition, then you might find this baptism card useful for religious gatherings in your community. The power of prayer should never be underestimated. 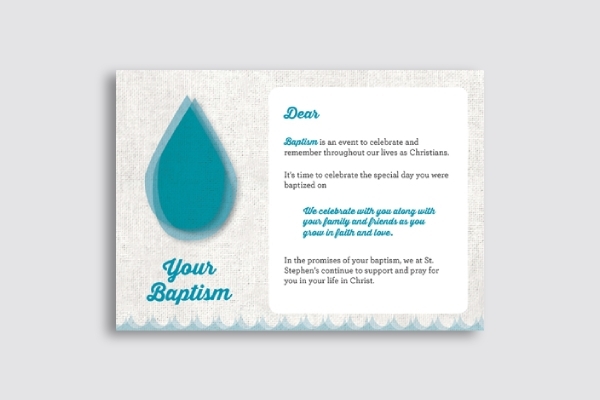 To pray for the safe and healthy upbringing of a child, it won’t hurt to use prayer cards during one’s baptism. This should serve as a guide for guests to come together and express their sentiments toward a child’s admission to the Christian life. If you’re hosting a large event but still want to keep it as an invite-only occasion, it’s best to use an RSVP card to note down who’s coming or who can’t make it. 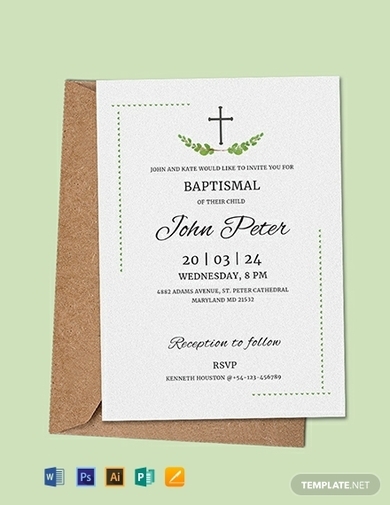 This should be sent several weeks prior to one’s baptism to ensure that guests are notified in advance. This will help you keep track of the number of people attending the celebration to ensure you don’t exceed the allotted venue capacity and budget. 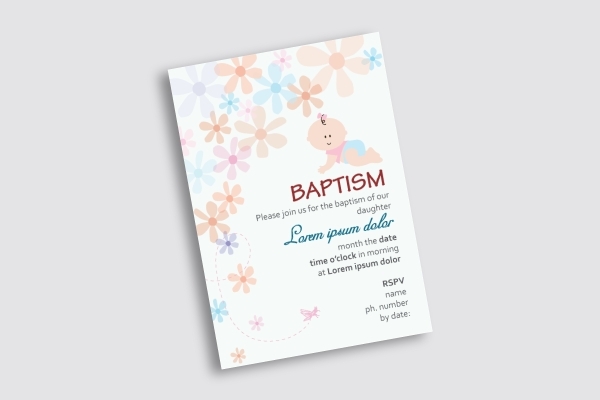 Baptism cards don’t always have to be made as an invitation to guests. If you have the resources for it, feel free to design commemorative items to celebrate one’s adoption to Christianity. A simple yet elegant design is sure to make the event even more notable for everyone attending. 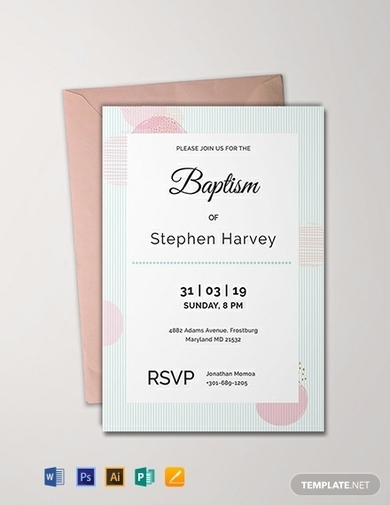 If graphic design isn’t one of your strong points, it would be a better idea to use photographs for your baptism cards instead. It can be a photo of anything that best symbolizes the celebration to make the card worth keeping. Be sure to use high-quality images for this so all your time, effort, and money don’t go to waste.